Dr Jerold S. Bell, D.V.M bred German Short hairs(http://www.westwindgsps.com/ ) He is a master Bird dog hunter so these words are really worth ready for anyone who plans on dog breeding. Dogs actually have more genes than humans. Tens of thousands of genes interact to produce a single dog. All genes are inherited in pairs, one from the sire and one from the dame. If the inherited genes from both parents are identical they are said to be homozygous. If the pair of inherited genes is not similar they are said to be heterozygous. The gene pairs that make a German Short Hair breed true to type are obviously homozygous. However, variable gene pairs like those that control coat color, size, scenting ability, etc. are still heterozygous within the breed as a whole. Line-breeding concentrates the genes of a specific ancestor or ancestors through their appearance multiple times in a pedigree. When a specific ancestor appears more than once behind at least one animal on both the sire’s side and yet another animal on the dame’s side homozygosity for that animal’s traits are possible. However, if this specific ancestor appears only through a particular offspring of the ancestor in question then the Breeder is actually breeding on this offspring of the ancestor rather than on the ancestor itself. This is why having many “uncovered crosses” to a specific ancestor (those that come through different offspring of this specific ancestor) gives the Breeder the greatest chance of making the desired traits of the specific ancestor homozygous. Inbreeding significantly increases homozygosity, and therefore uniformity within a litter. 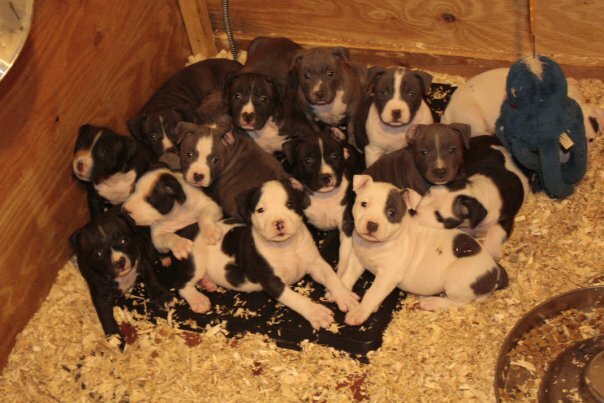 One of the best methods of evaluating how successful a line-breeding has been is to gauge the similarity of the litter mates as compared with pups of other litters with similar pedigrees. 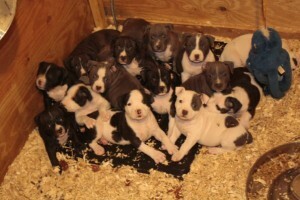 Considerable similarity among litter mates tells the Breeder the genes have “nicked” or paired together as anticipated. The resulting pups will likely be able to pass these genes to the next generation. Undesirable recessive genes are always masked by a dominant gene. Through inbreeding a rare recessive gene can be passed from a common ancestor on both the sire and the dame’s side creating a homozygous recessive offspring. The resulting offspring actually displays the trait neither of their parents displayed (even though both of them carried it). Understand that inbreeding does not create undesirable genes it simply increases the chance that traits which are already present in a heterozygous state within the breed will be displayed. When it comes to dog breeding to many breeders outcross as soon as an undesirable trait appears, blaming the problem on breeding “too close.” Nothing could be further from the truth. In fact out-crossing insures that the undesirable trait will be carried generation after generation in a heterozygous recessive state only to rear its ugly head again and again. Therefore the Breeder who turns away from breeding “close” is simply passing a known problem on to succeeding generations and future Breeders. When an undesirable trait is “unmasked” the Breeder who does his breed a real service is the one that stays with his line long enough to rid it of the undesirable trait. By controlling which specimens within their line are used for breeding in succeeding generations this Breeder can eliminate the undesirable trait. Once the recessive gene is removed it can never again affect the Breeder’s line. Inbreeding doesn’t cause good genes to mutate into bad genes it merely increases the likelihood that they will be displayed. The “inbreeding coefficient” (or Wrights coefficient) is an estimate of the percentage of all variable genes that are homozygous due to inheritance from common ancestors. It is also the average chance that any single gene pair is homozygous due to inheritance from a common ancestor. Our pedigrees display the inbreeding coefficient for each dog in the first 4 generations of a specific dog’s ancestry. Each inbreeding coefficient is calculated from that dog’s 10 generation pedigree. Note: Inbreeding does not cause good genes to somehow mutate – it only increases the likelihood that existing genes will be displayed – allowing the Breeder the chance to eliminate what had previously been unseen in their particular line although it was always present. At Westwind GSPs we gauge the amount of homozygosity in an animal using their inbreeding coefficient (or Wrights coefficient) – which can be seen as an estimate of the percentage of all variable genes that could be inherited from common ancestors. It is also give us a mathematical value for the average chance that any single gene pair is homozygous due to inheritance from a common ancestor. Our pedigrees display the inbreeding coefficient for each dog in the first 4 generations of a specific dog’s ancestry. However, the inbreeding coefficients displayed for each dog in our pedigrees is in turn calculated from that particular dog’s 10 generation pedigree. We can trace most of our dogs back more than 20 generations – some as far back as 35 generations. However, it must be remembered that simply knowing the inbreeding coefficient of a dog does nothing to help us understand which ancestors the dog is actually bred on. We know that the animal in question has many crosses to the same ancestors but we don’t know which ancestors they are. To understand this, and to unlock the secrets of a dog’s pedigree, we must do a homozygosity study. So while knowing a dogs inbreeding coefficient is important in accessing its potential to throw its type we still need to clearly understand which dogs behind a particular dog are the most influential. Simply knowing how homozygous a particular animal is does nothing to help the conscientious Breeder understand this. To understand this and to unlock the secrets of a particular dog’s pedigree we must do a homozygosity study. We need to know which ancestors the dog in question is bred on. On more than one occasion we have seen pedigrees in which the most influential ancestor for a homozygous trait doesn’t even appear in the first three generations. In this type of situation it is not unusual for this particular ancestor to contribute 50% of the homozygous genes of the dog in question. In this case if a dog is 16% inbred one ancestor would be responsible for 8% or 50% of the dogs homozygosity. It is of paramount importance for the dedicated Breeder to know not only the inbreeding coefficient for the resulting litter before the mating is done but also which dogs in the pups pedigree are influencing their genetic potential. Far too many matings have been done only on the basis of physical appearance with little if any regard to the sire’s and dame’s respective pedigrees or the interplay between the two. Novice Breeders don’t realize that individual dogs may share desirable traits but inherit them differently. This is especially true of polygenic traits, such as ear set, bite, or length of forearm. And many Breeders fail to understand that breeding dogs which are phenotypically similar but genotypically unrelated won’t produce the desired traits in the current litter – and will actually reduce the chance of these traits being reproducible in the next generation. In choosing a line of dogs within any bred it is wise to choose a line with “critical mass”. Find a line within your breed where the most pre-potent individual was mated many times and produced many superior offspring. Without enough genetic diversity it will be more difficult to find animals within the line that do not also share the faults of the pre-potent individual. These are the faults the Breeder will have the most difficulty in eliminating. In all mammals the females are “X” “X” and males are “X” “Y” which means that only females carry the genetic code particular to the part of the gene string that is missing in all males. Horse Breeders refer to it the “X Factor” and have demonstrated that the gene responsible for the large heart so many great racing stallions have can be traced back thru their motherlines to a single mare that lived more than 100 years ago. If a stallion has an oversized heart – like Secretariat – this particular mare will show up in his motherlines over and over again. The mares themselves don’t have the large heart but they carry the gene for it on their “X” chromosome. Likewise the stallions do not throw the large heart themselves. Successful Breeders realize they are fighting “the drag of the breed,” which is the tendency for all animals to breed back toward mediocrity. If it didn’t work this way super species and super races would have developed long ago in every animal on earth. For instance in human beings it is impossible to breed parents with high IQs together to produce higher IQs. Even when two genius have children the average IQ of their children will be half way between normal and the average of their IQs. By the way Einstein himself was the off spring of parents who were themselves first cousins – and he married his first cousin. So much for the tails of woe you heard in school about the effects of inbreeding. In fact the history of the German Shorthaired Pointer is replete with many examples of intensive inbreeding that produced some of the more influential dogs in our breed. Useful information on Motherlines This article was originally written in the 1930s by Dr. Kleemann (by whom the German Kleemann Seiger or KS tests were developed and for whom they are named. It was first reprinted in the Kurzhaar Blatter in August of 1962 then subsequently translated into English and reprinted in the GSP News in 1963. Once again it has been reprinted here (after being edited for brevity) for your review. What is the meaning of “Motherlines?” The idea is too often confused by breeders with “motherside” or the bottom side of a pedigree, but Motherlines is the whole of the bloodlines of all the mothers, including the father’s mother and the other mothers on the father’s side of the pedigree; but always the mothers. Pedigrees only serve as a guide to show us what “blood” could be carried by certain animals. Only through careful study of a particular animal’s offspring and intimate knowledge of its ancestors can we determine what “blood” an animal is actually carrying. It is necessary to breed both according to bloodlines and performance to achieve success. We are looking for animals who are outstanding performers within the same bloodline. And then there is Herta von der Maylust who was considered a “cat” at shows because of her fine build and light bone structure and was advised not to be bred because (it was thought) she would only produce poor small puppies. Yet Herta is a Stamm (original ancestor) mother behind many of our great dogs today. ing for the rest of us to follow.